Central Grampians Palliative Care Services operates from East Grampians Health Service and covers a wide area within the Grampians and Pyrenees Regions. Our aim is to work with patients, their families and carers to achieve a level of care that optimises an individual’s quality of life. The service liaises with a variety of local health and community services to assist in personal care, symptom management, home help and transport. 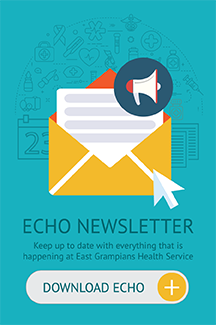 Staff work with the local GP, local hospital, District Nursing, Bush Nursing Centre, Occupational Therapist, Physiotherapist, Stoma Therapist, Social Worker, Dietician, Shire Council Workers, Oncology and Radiation Therapist. The service also has access to the Regional Palliative Care Team, working closely with Palliative Care Specialists, Nurse Practioners and Physicians. Central Grampians Palliative Care also loans a wide variety of equipment and aids to enable independence to be maintained for as long as possible and home nursing care easier. The service is available to any person living in the region where palliative care rather than curative treatment is the appropriate care of choice. Patients can self-refer, or referrals can be made by anyone involved with the patient in association with the patient’s own doctor and the patient’s permission. Over the past 12 months, Central Grampians Palliative Care Services has continued to provide care to those members in the community facing a life limiting and/or terminal illness. It has built on its relationships with many other health providers and Doctors to ensure that the appropriate health care is delivered in a timely and professional manner.